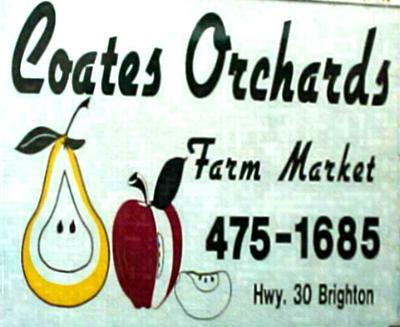 Coates Orchards / Farm MarketRecord Owner? Log in. From the 401, take exit 509 and drive 1/2 mile south on Cty Rd. 30. Market is on left (east) side of the Hwy. Open 7 days per week in season. 8:30am - Til' dusk. Open all winter, sales room atop of drive way hours flexible. Primary producers of asparagus various other home grown vegetables, apples and pears. Over 40 varites of homemade jams, jellies, relishes, and pickled asparagus. Freshed picked apples beginning mid July, Varieties available Close, Quinte, Lodi, Melba, Paulared, McIntosh, Red Delicious, Empire, Spartan, Cortland, Tolman Sweet, NW Greening, Northern Spy, Ida Red, and Russett, all listed in the sequence of harvest. Fruit baskets created for all occasions. Pumpkins and various varities of Squash available in October. Active AppleFest, Brighton Farmers' Market promoters. 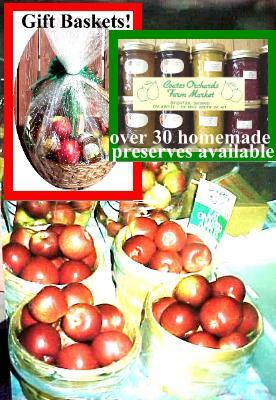 Have something to say about Coates Orchards / Farm Market?